As we had an early start in the morning, Sadie had already spoken to the reception guy the previous evening (as their breakfast starts at 7am, with our pick up arranged for 7.30am) and arranged for it to be pre-ordered and ready for us. Sadly, when we sat down at 7am, it seemed he hadn’t arranged this, and the kitchen staff just appeared out their accommodation and went off to prepare it. Plus, the guy had got the order wrong with wrong drinks arriving and we didn’t get our breakfast till 7.15am… and even at that they forgot to bring the coffee too! We were quite annoyed as up till then, the staff were brilliant, and the hotel was decent too. He did apologise to Sadie, and as our Tuk Tuk arrived, we just managed to leave on time albeit rushing our breakfast down. 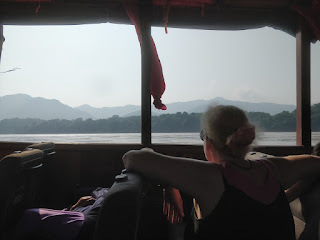 We set off to the boat jetty which is 9km out of town, after stopping to pick up 2 French guys who were not even ready as they though the pick-up time was 8.30am, but that is when the boat leaves! The driver helped us sort out the tickets, and we go down to the pier and onto one of the traditional long boats that cruise up and down the Mekong daily. 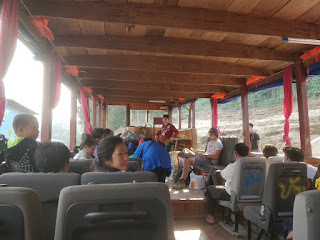 These are basic boats, with a mixture of tourists and locals using them, and have old car/mini-bus seats arranged loosely into rows the full length of the boat. They are not attached to the floor, so you are able to move them around and one local family even pushed 4 together to make a double bed! They have 2 basic toilets near the back of the boat and will also sell you water/coffee/pot noodle kind of snacks, albeit at a slightly higher rate than onshore. However, as we had already got our snacks sorted, we didn’t need to buy anything else. 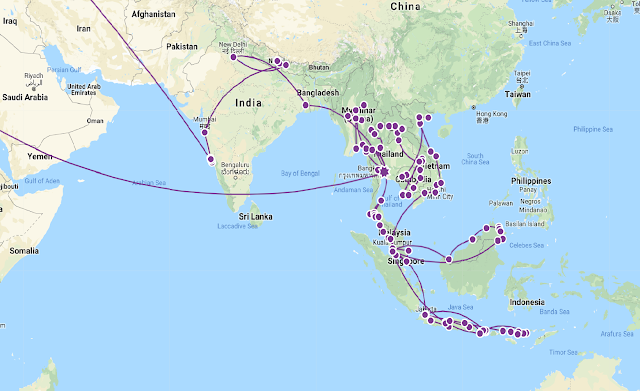 This is a 2-day journey, with each day being approx. 8-9 hours long, and as we were going upstream we expected perhaps 9-10 hours. 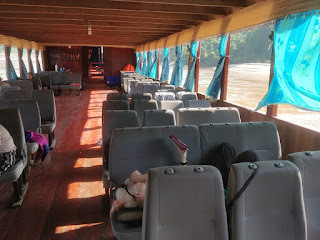 Luckily enough, with it being low season the boat was not that busy, and with about 100 seats and only 25-30 people on it, we all managed to get a row of seats each and spread out. 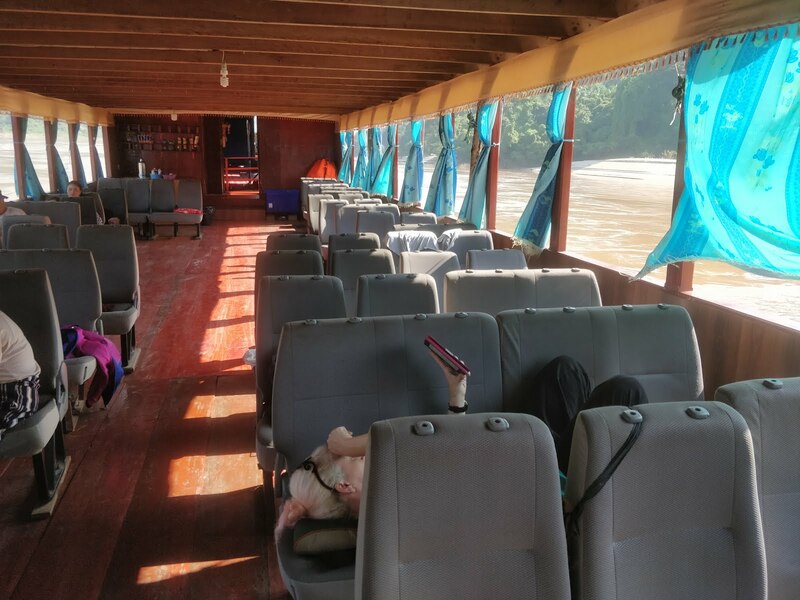 There are no windows on the boat, just open sides with some curtains and it did get a bit warm at times, no fans or aircon or even any power available at all. 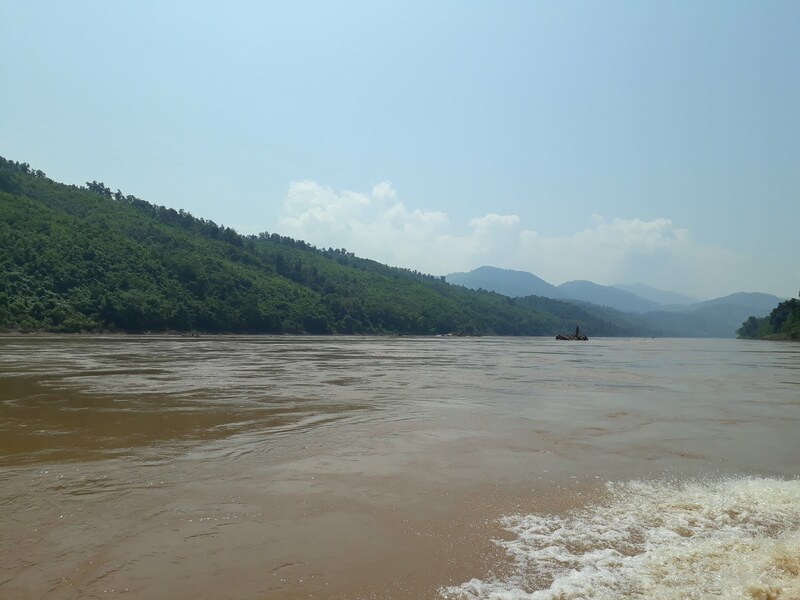 However, the lack of comforts was made up by the amazing views on either side of the boat, with rolling mountains, jungle, limestone karsts and small villages with livestock grazing by the river and small kids bathing in the muddy brown waters, this more than made up for it. As we got further and further upstream the views got better and better, this was an amazing trip and so glad we decided to do it. A couple of times the boat pulled over to the shore to let a local on or off, however we didn’t stop for long and the small kids by the shore waved us off (or tried to sell us wristbands etc). 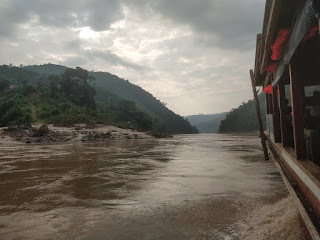 Our overnight stop was in a small riverside village called Pak Beng, which is used by the boats as a stopover, then they return to their starting points the following day and we would catch a different boat on the 2nd day. We had pre-booked our hotel here, and we were happy to see they had sent someone down to meet us when we arrived around 6pm, however on looking at Google Maps, it was only a few minutes’ walk away, but a lovely thing to do. Hopping aboard a waiting truck, we get whisked off to our hotel, BCK Villa whilst the other few tourists on our boat all haggle with the awaiting reps from the other hotels for accommodation options. As it was for 1 night only, we just picked somewhere which was under budget and had what we needed – breakfast, hot shower, aircon etc and we were all happy with what we got. Quickly dumping our stuff, we took a walk along the one main street that makes up this village, which is just lined with restaurants, shops and bakeries. We clocked a couple of places to try for dinner, and a couple of places to pick up snacks the following morning for the next journey. As it was our last night in Laos, we decided to go local and went to one of the few places that are mentioned on TA, it was called Sabaidee and had our last Laotian dishes, which were lovely. I was shattered by this point and wanted to get to bed ahead of the long day again tomorrow, but as we got back to the hotel, we could hear some thumping dance music coming from the bar next door. The Happy Bar wasn’t making me feel very happy, thankfully it seemed to get a bit quieter around 10.30pm and we managed to drift off to sleep in our comfy bed. 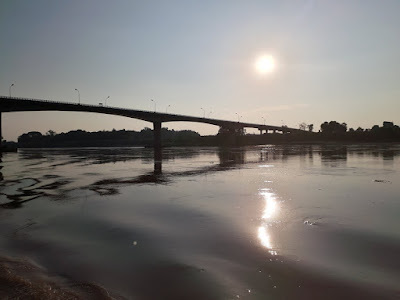 The next morning was an early trip to a couple of the bakeries to get some filled baguettes and pastries, then back to the hotel for a lovely breakfast before the owner kindly gave us a lift to the boat around 8am. 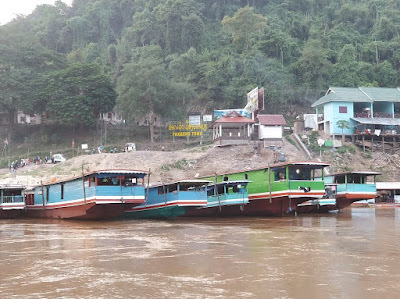 As mentioned, it is a different boat you get the 2nd part of the journey, from Pak Beng to the Laos/Thailand border town of Huay Xai. This time it was a wider boat, with more room on it and more free seats. 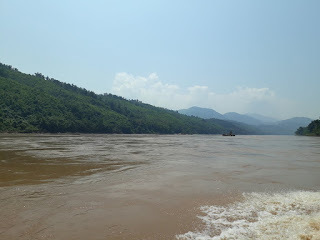 With a mix of locals and tourists again, we set off upstream for the 8-9-hour journey, again with amazing views either side of us. It did a couple of riverside stops for locals to get on/off again, and with the sun shining most of the way, it was a case of swapping sides to avoid being burnt! We tucked into our snacks throughout the day, and as tempted as I was for a few last Beer Lao’s, I was aware that we had very few Kip left and needed them for the border. 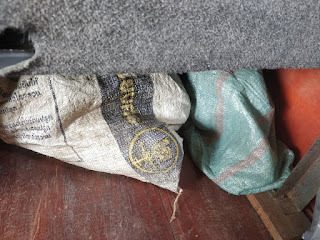 Sadie had a local couple sat in front of her for the whole journey, with some bags that were under their seats... half way into the journey one of the bags were moving, after a quick prod we came to the conclusion it was a live chicken probably for their dinner! We arrived into Huay Xai around 6pm, and our hotel was expecting us before 9pm as their reception shuts at that time. Jane let them know we would hopefully be there on time, but if not, they were going to leave key and instructions at the desk anyway. 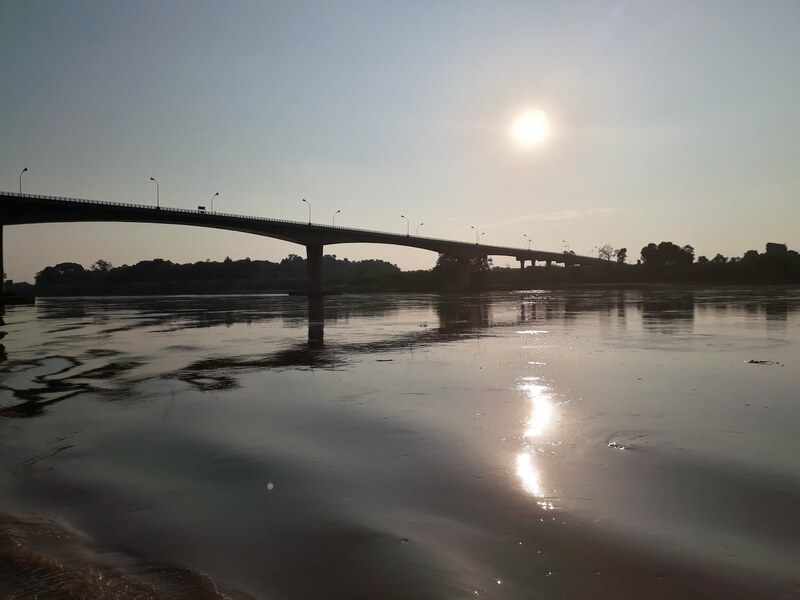 You used to be able to get off the boat, and then take the small ferry across the river as the border crossing, but since the Friendship Bridge was opened in 2013, you now have a long way around for a short cut. 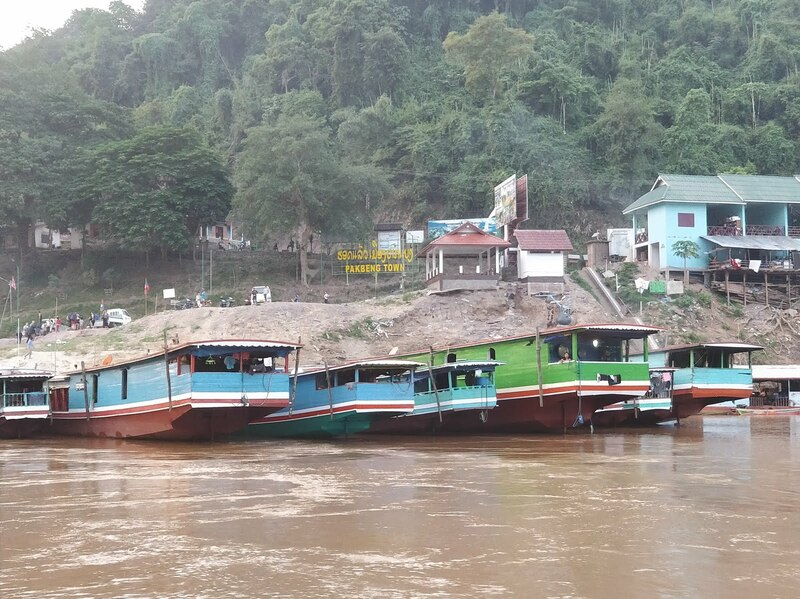 Once off the boat, you need to get a Tuk Tuk from the river for 9km back downstream to the Laos Immigration Checkpoint. Luckily there was us 3, 2 other girl travellers and an older Japanese man all going the same direction and destination, so we all agreed to share. The driver wanted 25,000 kip each, we got him down to 20k but still overpriced for the 15-20 min journey. He dropped us off and we queued for our exit stamp, I was a bit worried as I didn’t have the original departure card I filled in a few weeks ago, as the issues we had when arriving in Laos, they didn’t give me it back as expected. Anyway, the official wasn’t interested in that, stamping my passport and advising I needed to pay 10,000 kip ‘Overtime Fee’. As this was only a £1, I paid up and advised the rest of the same fee! Once through that point, you then need to get a shuttle bus across the bridge, again another ‘fee’ of 10,000 kip which is higher after 6pm apparently, but you have no choice as you are not allowed to walk across the bridge anyway. We all change the last few kip with the ticket seller, he gives a poor rate, but we only had enough for 120 Bhat anyway which is only £3. The short journey over the bridge only takes a few minutes, and we then go to the Thai Immigration Checkpoint, fill in our arrival/departure cards and get our 30-day free visa exemption stamp. We then have a choice, all 6 of us are going to Chiang Rai so again agreed to share. There was a taxi stand outside who were quoting 2500B (£60) for us to get there, so at £10 each it wasn’t bad for the 2-hour trip. Or we could chance getting a Tuk Tuk into the small border town of Chiang Khong and seeing if there was another bus or cheaper taxi/minivan to get. As time was getting on, we decided to just book with them, and would need to wait 15 minutes or so till the driver arrived. The 3 of us all tried to get cash out the only ATM there and had no luck. Thankfully one of the other 2 girls managed to get some Bhat out, so we could get on our way and then we could stop at another ATM. So the driver turned up (with his date for the night it seemed) and then we stopped at one 500m down the road, I got out and this was the worst cash machine ever with hundreds of mosquitos and other insects all flying around it and it was the worst thing ever… thankfully it worked and I got cash out! We then set off on the journey, which wasn’t too bad apart from him speeding for the 1st half, well until he hammered into a pot hole and then decided to slow down a bit. As we got nearer Chiang Rai, we asked him if he knew where the other girl’s hotel was, and he had a hissy fit saying he was dropping us at the bus station. Well he didn’t take it kindly when we told him he was dropping us at both our hotels and had a good moan about it in Thai to his date! He dropped us off first (and the quiet Japanese man) as he couldn’t get up the way to their hotel due to road closures for the market and a night run. We said our goodbyes to the girls, then the Japanese man disappeared into the hotel next to ours to ask for a room, and we just made it in time to our hotel at 9pm as the reception girl was just getting ready to leave. 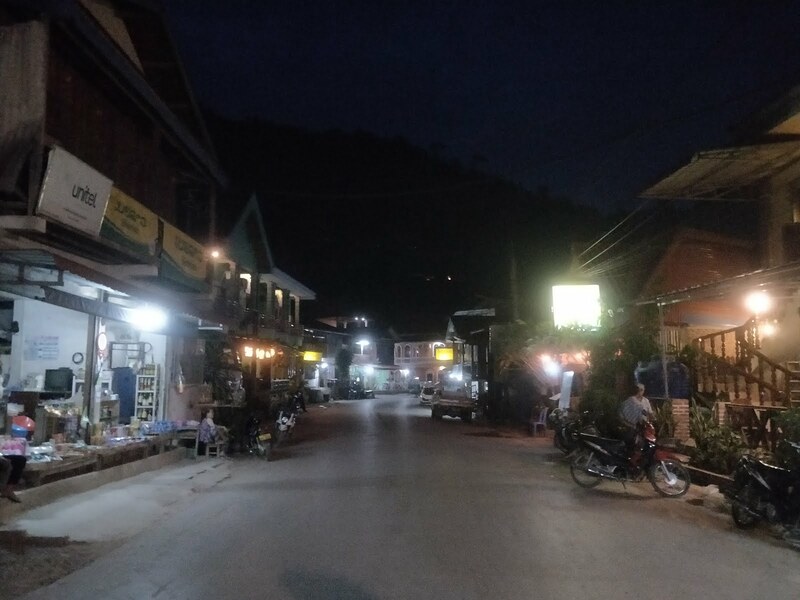 After checking into our hotel, Rinlada Guesthouse, which is 10 minutes away from the main part of town, we quickly dump our stuff and go out for food. We then took a walk along the ‘Walking Street’ Saturday night market, before retiring to bed after a long day travelling.